Islamist alliance led by Al Qaeda's Nusra Front makes gains in Idlib city; regime airstrikes attempt to blunten advance. Islamist rebels made fresh advances Friday on the edges of Idlib city in northwest Syria, after fierce clashes that have left dozens of dead, a monitoring group said. "The fighters have advanced on the northwestern and southeastern sides of the city," said Rami Abdel Rahman, head of the Britain-based Syrian Observatory for Human Rights. "There are very violent clashes, and last night 26 militants and four regime soldiers were killed," he told AFP. An activist from the area said civilians were trapped in their homes. "The humanitarian situation is very difficult. There are refugees from other parts of the country who are in Idlib," said Ibrahim al-Idlibi. On Tuesday, a new coalition of Islamist rebels launched a coordinated attack against Idlib city, which is held by Assad regime forces. Calling itself "The Army of Conquest," the coalition is led by Al Qaeda affiliate the Al-Nusra Front and includes several other Islamist groups. The rebels have advanced using "street fighting," taking control of the city's edges, neighborhood by neighborhood, said another activist, Khaled Hanoun, who is in contact with rebels in Idlib. 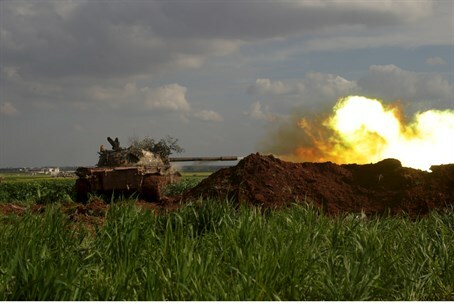 According to Abdel Rahman, the Syrian army had sent in reinforcements and carried out air strikes on rebel positions on the outskirts of Idlib. The province of the same name is largely under the control of the Nusra Front, but provincial capital Idlib city remains in regime hands. If it falls to rebel groups, it would be only the second provincial capital lost by the regime after Raqqa, which is now the de facto capital of the Islamic State jihadist group. Since Syria's conflict began in March 2011, more than 215,000 people have been killed and around half the country's population has been displaced.